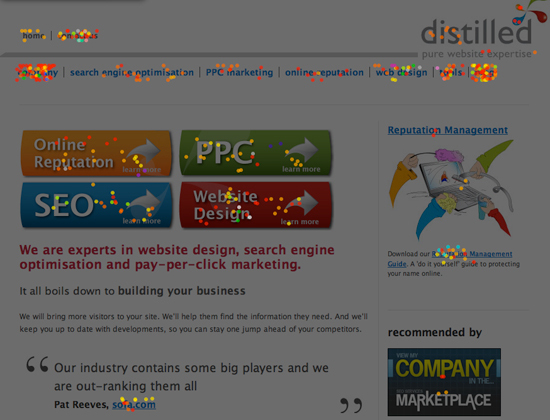 So, as promised, over the last couple of weeks we have been running a Crazy Egg test on the Distilled site. You may have noticed quite a dramatic change to the home page: we have brought our four main focuses of work out of the main menu into bold call-to-action buttons. This helps people to see more clearly our main areas of expertise without having to read the much smaller text in the menu. 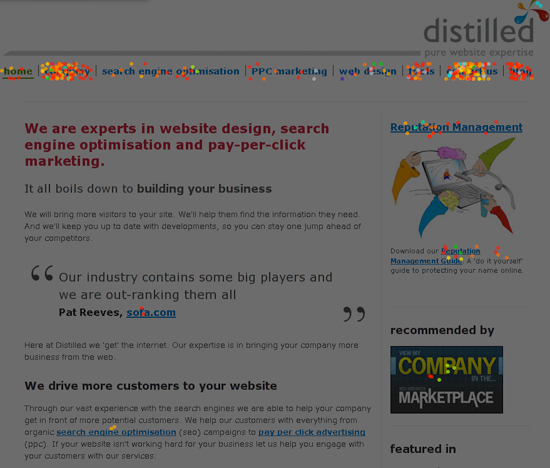 We used the Crazy Egg test to monitor 1000 visitors on the Distilled home page, for two separate designs. The first design (our old home page). The majority of clicks were on the 'Contact Us' and 'Company' links. A spattering of clicks were evenly distributed between our four main areas of expertise, both within the menu bar and the reputation management feature on the right hand side. Hardly any one clicked on the Distilled logo. The new design with bold call-to-actions was launched on 20/05/08. It is clear that the call-to-action buttons have been a success. The main body of clicks now seems to be divided between the call-to-actions and the top navigational menu. However, as more users get used to the new design I wonder if the ratio of clicks between the main menu and the call-to-actions will verge more towards the call-to-actions. It would be useful to monitor whether the number of people who clicked on any of the links increased. This would indicate that a higher percentage of people understood the options available to them. People tend not to spend long on a page so it is imperative that at a glance your users know what their options are. Hopefully the call-to-action buttons will help that. If this is true, we should see a decrease in the bounce rate of people landing on the homepage and immediately leaving it. This will be difficult to gauge in this instance as, during our second test, we had our team building day. The buzz surrounding this caused our click through rate for that day (and a few of the following) to greatly increase above normal figures. The team building day may also mean that people tended to click links that they may not normally have done. Only time will tell as to whether this new feature will permanently increase our click through rate and indeed consequently boost new custom.